Mya-Kai at the scene of the crime. Who but Nancy Leson could utter the phrase "The dog ate my carrots"? Was there no homework in the house that day? "She came in with a little orange around her mouth," Nancy told me. "And we realized, oh my god she's eating the carrots." Which apparently didn't agree with her. "We had to take her to the vet." No more big vegetable gardens for Leson. This year it'll be potted herbs only. "I just have to face it: herbs are the only thing I can grow." Husband Mac agrees. "She's good at the planting – and that's where it ends." At stately Stein-DeGroot Manor, we've found that our herbs do better in the ground than in pots. Most of them made it through winter's snow and Big Freeze, though we will have to replace the thyme. We're devoting half of one of our two raised beds to nothing but herbs: English and lemon thyme, rosemary, sage, oregano, chives, parsley, tarragon and, because I want the roots for some Southeast Asian dishes, cilantro. We'll pick up a potted basil plant in the next week or so, too. But there is one thing I won't be planting anymore. We've had great crops in past years, but I've concluded that it's just not worth all the space they take and the all-day job of processing them through the food mill for puree. If we were fresh tomato eaters it would be different, but I use them only for sauce. Feel free to flame, but I think that canned, skinless, whole tomatoes (I like Cento) taste pretty much the same as fresh once I've pureed them with an immersion blender. 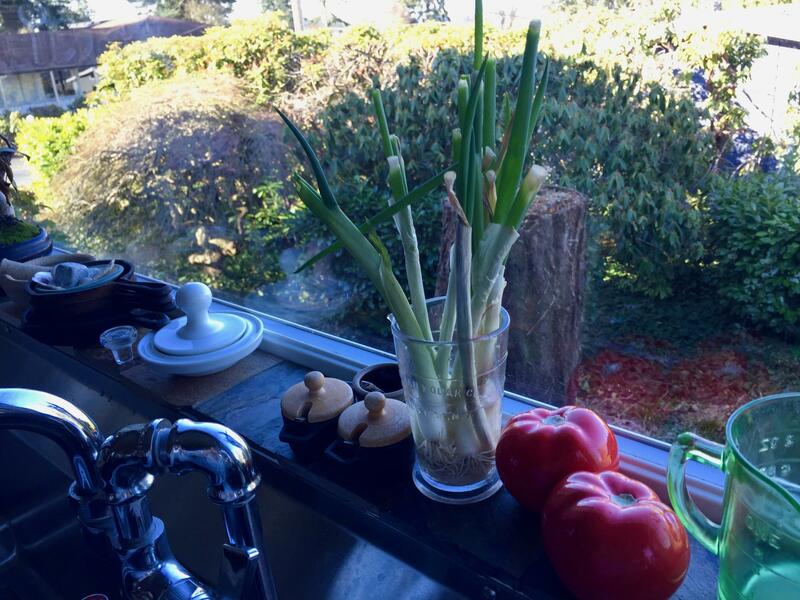 Nancy's got a bunch of scallions growing on her kitchen windowsill. "Take four, five, six, even if they look scraggly and put them in a glass of water just over the roots." You can just keep snipping the greens. "They grow back fast," she says. Nance has been snipping from these for six weeks. Other than herbs, the one outdoor plant she's looking to sow this year are some some fancy-pants potatoes, the Upstate Abundance she's ordered from Row 7 Seeds. I told her that all eyes will be on them. Then I ran. "Even a potato in a dark cellar has a certain low cunning about him..." – Samuel Butler, "Erewhon"